For today’s Little Crochet blog tour stop, I virtually sat down with Vickie Howell for a Q+A about Little Crochet. You might know Vickie from her time as host on Knitty Gritty, for her many books [Vickie Howell's Pop Goes Crochet! and Craft Corps are just a couple], and psst, for her new yarn line with Caron–Sheep(ish). On a side note, I already had the pleasure of working with Vickie’s new yarn, and it’s great! I’ll write more about it at a future date. Vickie’s questions include my inspiration for writing the book, crocheting in my family, + top gift ideas in the book, among others. Head on over–you’ll also have a chance to win a copy of Little Crochet! And hey, since Easter is coming, you should also check out Vickie’s cool free pattern for a Bitty Bunny. I know, you don’t have much time, but I think you can crank it out by Sunday if you are determined. Also today I wanted to mention a little suprise I got in the mail yesterday, in the form of Pregnancy+ Newborn magazine. Now- don’t get any ideas, it was just a review copy. (But talk about a good way to scare your boyfriend.) 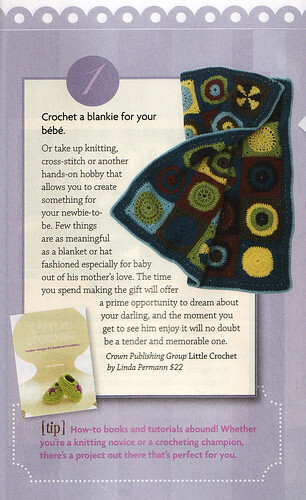 They included this nice little snipped on Little Crochet–and the writer’s mom actually crocheted the Mix and Match Motif Blanket shown in the clip. Now that’s what I call going above and beyond! Pretty cool! I would try asking Vickie....otherwise, do a google search.